The Montreal Canadiens are off to a momentous start, commencing the season with five straight wins for the first time in franchise history. Their fifth win came against the New York Rangers on Thursday night, with Habs goalie Carey Price picking up a shutout in the 3-0 victory. The Canadiens have owned the Blueshirts since 2007-2008, with Price picking up his seventh shutout against them in 18 regular season games. The Canadiens began the 1977-1978 season with four straight wins, cementing the franchise’s previous record and solidifying the Habs’ Flying Frenchmen as a team to be reckoned with. Those were the days of Guy Lafleur and Jacques Lemaire up front, with Scotty Bowman as head coach and Ken Dryden in goal. That team finished with a 59-10-11 record, the likes of which we may never see again, and Lafleur took home the Art Ross Trophy with 132 points. The cornerstone this year appears to be Montreal’s speed, much like it was the case in Lafleur’s day. This incarnation of the Canadiens finds Max Pacioretty leading the NHL with four goals in five games, plus he’s had 21 shots on goal. His hot start comes on the heels of missing a chunk of the preseason with a leg injury. 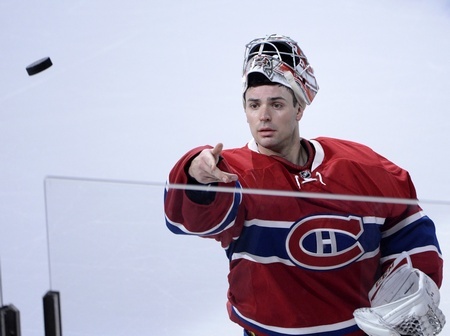 As for Price, he’s been lights-out against the Rangers as has been well-documented. The reigning Hart Trophy and Vezina Trophy winner has shut out New York in six of his past 11 starts at the Bell Centre. That’s an unreal level of mastery against a team as good as the Rangers, especially when you factor in Henrik Lundqvist in the Blueshirts’ goal. Lundqvist was also good on Thursday night, making 29 saves in the losing effort. But at the end of the day, the game belonged to the Habs. Montreal will face off against the Detroit Red Wings on Saturday at the Bell Centre, where they’ll look to push their win streak to six straight. The Red Wings haven’t lost yet and will meet the Carolina Hurricanes at home before they meet the Habs.